GO2TM is the Gold Standard in Water Disinfection. Pails for 100, 200, 500 and 1,000 Liter solutions. GO2 is extremely easy to make, and has no dangerous side effect. Hoewever, always follow the GO2 MSDS for component A and B, and for the 4,000 ppm concentrate. * A direct cost comparison by volume with other disinfectants does not provide a true comparison with GO2. 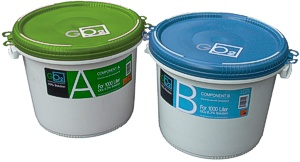 High yield rate: 5 L (1.32 Gall) of GO2 at 0.1 ppm will treat 200,000 L (over 50,000 Gall) of water.